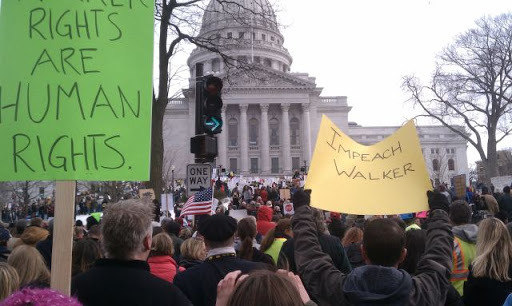 I BET YOU A DIME TO A DOLLAR THE NATIONAL EDUCATION ASSOCIATION HAS THEIR FINGER PRINTS ALL OVER THE PROTEST,OUR CHILDREN TAKEN OUT OF SCHOOL AND BUSED TO THE STATE HOUSE PROTEST. 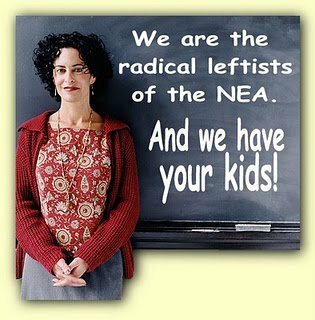 OUR PUBLIC SCHOOLS ARE FULL OF MARXIST,COMMUNIST,SOCIALIST (CALLED TEACHERS/PROFESSORS). SOME OF OUR PUBLIC SCHOOLS HAVE COMMUNIST CLUBS/YOUNG COMMUNIST LEAGUE RECRUITS FROM OUR PUBLIC SCHOOLS. 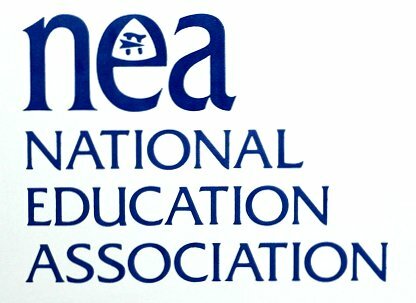 HAVE A LOOK AT THE NATIONAL EDUCATION ASSOCIATION NATIONAL WEB SITE, REALLY TAKE THE TIME TO READ JUST WHAT THE NEA IS REALLY UP TO. REMEMBER THEY ARE THE LARGEST UNION IN THE UNITED STATES, AND JUST ONE MORE TIDBIT OF INFORMATION. OUT OF ALL THE BILLIONS/MILLIONS OF DOLLARS THEY HAVE TAKEN IN DUES OVER THE YEARS, THEY HAVE NEVER EVER CONTRIBUTED ON DAMN DIME TO A REPUBLICAN/CONSERVATIVE RUNNING FOR OFFICE AT ANY LEVEL. Has our education system failed America’s children? Not in the minds of “progressive” educators and utopian globalists. They have yet to fulfill their revolutionary vision, but they are well on their way to a tragic victory. So while you and I decry the destruction of an academic system that produced nearly 100% literacy (at least at least in California) — seventy years ago, others cheer the changes that have traded facts for fantasy, truth for myths, academics for collective socialization and individual thinking for group manipulation. “… the real menace of our republic is this invisible government which like a giant octopus sprawls its slimy length over city, State and nation. Like the octopus of real life, it operates under cover of self-created screen. It seizes in its long and powerful tentacles our executive officers, our legislative bodies, our schools, our courts, our newspapers and every agency created for the public protection. This malignant “octopus” grew until its tentacles reached around the world. Strengthened by its countless affiliates — including tax-exempt foundations that shared its vision and funded its programs — NEA leaders and their international partners won power and influence in every strategic corner of the world. All along the way, they were molding minds that would fit their quest for a new world order. From the beginning, they were determined to destroy the old education system in order to build the collective world of their dreams. Reporting to the annual NEA meeting in 1935, Willard Givens (soon-to-be executive secretary) wrote: “…many drastic changes must be made…. A dying ‘laissez-faire’ must be completely destroyed and all of us, including the ‘owners’, must be subjected to a large degree of social control…. The major function of the school is the social orientation of the individual. It must seek to give him understanding of the transition to a new social order.” Samuel Blumenfeld. Psychology would provide the “scientific” tools for that transition. Dewey — who equated individual thinking with insanity — had begun experiments with behavioral psychology even before 1900. Half a century later, B.F. Skinner outlined the practical steps to behavioral control. “Operant conditioning shapes behavior as a sculptor shapes a lump of clay,” he wrote in Science and Human Behavior (1953). His goal for the human “clay” was no secret. Five years earlier, he had exposed his vision of a reshaped humanity: “What was needed was a new conception of man, compatible with our scientific knowledge,” he wrote in Walden Two. (1948)  Charlotte Iserbyt. Like their Soviet counterparts, who also envisioned a “scientifically” engineered human prototype (the “new Soviet man”), these revolutionaries knew well that their biggest obstacle would be Christianity. Therefore their main assault would be directed at the uncompromising truths of the Bible. Trust and loyalty to God must be replaced by loyalty and submission to the greater whole — the collective global village — represented by a Marxist-oriented world government. They have come a long way. Today, Christianity is banned from our government schools. Instead, students are immersed in the new global spirituality — a contemporary, idealistic blend of all religions — through classroom myths, rituals, symbols and multicultural experiences. This new spiritual synthesis has been adapted to fit the amoral, religious standards outlined by UNESCO’s Declaration on the role of religion in a culture of peace and Declaration of Principles on Tolerance. Keep in mind, the NEA shares the UN goals on every point. Small wonder, since its leaders helped establish the United Nations in the first place. Back in 1946, it celebrated the formation of UNESCO as “the culmination of a movement for the creation of an international agency of education.” What the NEA had begun in secret would now be officially established by this new global management system. The NEA Journal announced the victory: “each member nation… has a duty to see to it that nothing in its curriculum… is contrary to UNESCO’s aims. In other words, the NEA-UN blueprint for “lifelong learning” calls for a world-wide system of global standards and manipulative programs that would conform human resources of every age to its totalitarian aims. Our children would be trained, not just to conform to this system, but to be activists willing to serve, promote, spy and fight for a world government with zero tolerance for Biblical values or for the God we love. And every person would be monitored and assessed for their compliance with the ideals of our global managers. Hard to believe? Folks this has happened right under our noses for the past 100 plus years, NOW we see the fruits of the socialist movement,their agenda-just look to Wisconsin, a state that is full of socialist, a state that has more than it’s share of people working and depending on the government SOCIALISM/COMMUNISM WAS VERY EVIDENT AT THE PROTEST CARRIED OUT IN WISCONSIN THIS WEEK……….